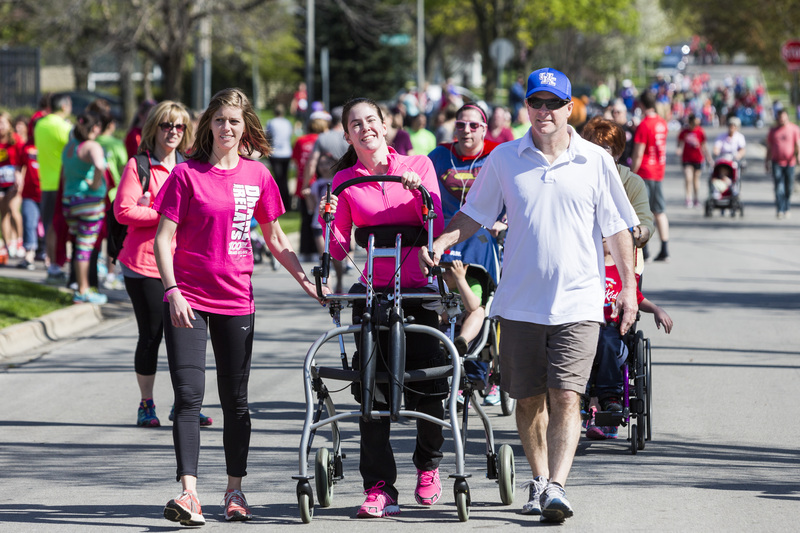 Hannah started this blog in 2012 as an Easter Seals DuPage & Fox Valley intern. You can read the first blog post here. The below post has been adapted from her personal blog. I woke up super excited as it was the day of the 12th Annual Run for the Kids: Superhero Hustle. Morgan comes in at 7:00am and is tired but excited! I picked out yoga pants, an Easter Seals T-shirt, and my Victoria Secret athletic jacket. I see Mom and Dad in the parking lot and I am pumped! I find my therapists and we go stretch in one of the therapy rooms. We quickly stretched and Mom helped us bring the walker to the start line. Mom had to go to my little sister’s water polo tournament but she took so many pictures before. 10, 9, 8, 7, 6, 5, 4, 3, 2, 1, START! I started walking with Dad, Joanne and Tami who are my devoted physical therapists, and Morgan. About a block in, Jenn, my main caregiver shows up with her dog so I have quite the entourage! I’m surrounded by little kids who have unimaginable challenges in their lives. They have a lifetime of surgeries and therapies to go through. However, on that day, they were being applauded for their heroism. To have them acknowledge me by cheering me on was humbling. In my case, being an adult has been easier than being a child with a disability. I had the storybook childhood but I had a lot more doctor appointments because I was always growing and that meant a lot of adjustments with my equipment or people wanting to make sure everything was working as it should. Now that we have that all figured out, Mom, Dad, and I know what is important which is my movement disorders so I see a neurologist once a year and physical therapy twice a week. That is nothing compared to other individuals with disabilities have to go through. We dodged so many bullets and that was why I was able to complete this goal. When I was roughly three blocks away, I could feel the energy of the crowd. I start going faster and faster! My dad had to speed it up along with my entourage! I was fifty feet from the finish line and the crowd is CHANTING my name! Morgan and Jenn start taking pictures. It’s my moment! I cross the finish line and its bliss! I did it in 46 minutes which is less than we anticipated which had been an hour. I got so many hugs and good wishes. I have to say thank you, thank you, thank you for the outpouring of love on Facebook and Twitter. It was unbelievable! Of course, thank you to my dad and other entourage members. It was an incredible mile! The real reward was a therapist coming up to me and informing me that her client now wanted to walk a mile next year. That feeling is priceless! Of course, thank you to Easter Seals DuPage & Fox Valley for 7 years of outstanding love and support! It is my last day at Easter Seals DuPage and the Fox Valley Region. I’m honored and humbled to be a part of an organization that is so focused on its mission. We earn everything we have, we come to work with hope, and we instill a sense of pride in our clients. We are unique and magical because of that. Easter Seals is a place of hope and support. Many parents are nervous when they walk through these doors. I have seen the sigh of relief when they walk out. Parents and clients get the support they need here. They get answers to the tough questions. They know their child will get the help they need. Most importantly, they know that they are not alone. Easter Seals, thank you for an incredible year. I will never forget it! We all know how important education is in the United States. Education is the pathway to a good job, making a decent living, finding out about yourself, etc. The list that education brings to one’s life is endless. However, being physically disabled can jeopardize getting an education. This is particularly true when it is time to start thinking about going away to college. Yes, being independent when you’re physically disabled can be a significant challenge, not to mention nerve-wracking for parents. As a college graduate myself, I can tell you that it is completely worth it. During my collegiate years, I was welcomed into a sorority, deepened my faith, changed the way I think about the world, and my college experience ultimately made me a woman. Now, I have to recognize that I am not medically fragile, do not have the incredible challenges of a learning disability, or need to go to the doctor frequently. We all have different abilities and we should make the decision to go to college based upon our personal abilities. As I said, the personal benefits are countless but there are other benefits too. “A typical college graduate earns roughly $650,000 more than a typical high school graduate over the course of a 40-year career, according to the Pew Research Center study” (dailyfinance.com). “Other benefits of going to college that don’t necessarily show up in the earning statistics are the experience students who attend college gain. People who go on to do higher education tend to be healthier and a generally more rounded person than someone who has just got a high school education” (importanceofcollege.com). Speaking of personal growth, I had so many fun opportunities. I mentioned it before, but I joined a sorority, Phi Mu. In high school, I didn’t really have friends. When I joined Phi Mu, the women in the sorority embraced me. They didn’t see the disability; they only saw me offering friendship and humor. We went to parties and philanthropy events together and they didn’t shelter me because I was disabled, I was just Hannah to them. I can relate to typical a college and soroity experience. The experience of my participation in a soroity can be compared to college academics, dorm life and so much more. I realize those facts cannot necessarily change your mind if you are scared to go to college but if anything, I urge you to do more research. I found a good place for you to start researching here. Also, I’ve been through the highs and lows of college life. Stop by the Development office, I would love to chat!